Matthew Goldenberg, DO Blog How does Marijuana Affect the Body? Unless you have been living under a rock for the past few years, you have undoubtedly heard that there is an ongoing debate regarding Marijuana's legal status and use as a medication. Furthermore, I have written about Marijuana's impact on Quality of Life on two previous occasions (you can access those posts here). I have received a great deal of feedback from those in favor and against Marijuana Legalization and Medicalization. There are many arguments both for and against every issue surrounding Marijuana. Members of both camps are very passionate and cite data to support their views. Scientific and medical discussions regarding this issue are becoming increasingly politicized and media driven. As a Psychiatrist, I always advise my patients that Marijuana is known to be psychoactive and can cause changes in mood, anxiety and thought content. It is extremely important to monitor these symptoms especially if you have any current psychiatric symptoms or a history of past psychiatric symptoms. I also encourage my patients to wait until further research arrives before declaring the debate has been settled in some definitive manner. I simply do not currently feel that there is enough research behind Marijuana to outright support or reject its medical use. We are truly in a gray area. There are some medical conditions, such as intractable seizures, where all other treatments have failed.1 I believe that in these cases, the risks of trying a medication not approved by the FDA may be valid (because the risks of going without treatment are likely higher than trying a novel treatment approach like Marijuana). For my patients who suffer from insomnia, anxiety, depression or other treatable medical or psychiatric conditions, I always recommend that they exhaust all established treatment options before considering Marijuana. Some patients feel that Marijuana is natural and likely less oppressive to their system than many of the traditional medications available. I advise these patients that we have an established benchmark for the level of empirical evidence for which we have come to expect for all other medications deemed to be safe and effective for use. If we simply jump the gun and declare Marijuana is safe and ready for use, we may miss out on potentially important research findings and additional uses that could help scores of individuals. I believe that we cannot let emotion or media pressures influence the scientific process. That is equally true for those who support and for those who are against Marijuana use. We must let science rule the day. I am fully in support of increased funding and support for Marijuana research. Should data arrive that supports Marijuana to be safe and efficacious for use, I would be eager to share that information with my patients. I always provide my patients information regarding the risks and benefits to any medication we are considering and also to alternative medications. I hope we quickly have information, comparable to all other medications, regarding the risks and benefits of use of Marijuana for a host of medical and mental health conditions. While we wait for that research to be conducted and for those data-sets to arrive, the best we can do is to understand what is already known from the information currently available. I recently came across a useful resource that helps to understand the various ways (both good and bad) that Marijuana affects the human body. Medline has produced an interactive resource that walks you through everything from negatives like lung irritation and impaired judgement to pros such as pain relief and glaucoma relief. 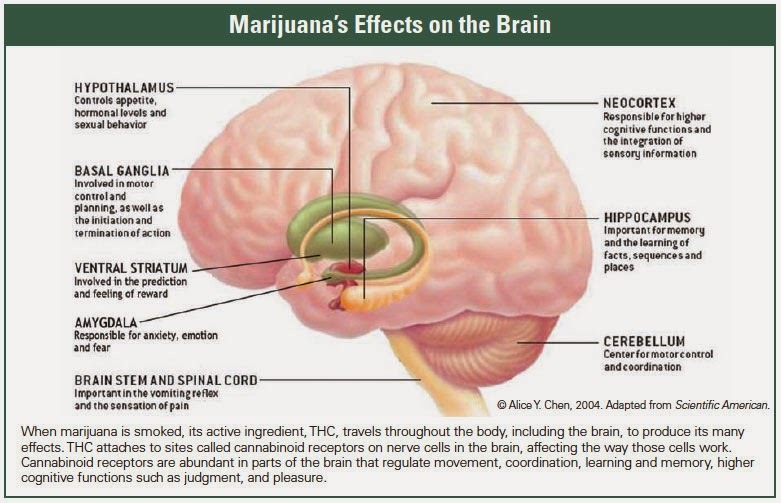 I encourage you to review this information and see if it changes your views on Marijuana. You can access the resource here. Regardless of your intention to use Marijuana for medical or recreational use, it is important to understand how the active products, including THC and CBD, and non-active products, like smoke or vapor, will impact you. I always advise my patients that we must weigh the risks and benefits of using any medication. Marijuana should be no different, especially if we intend to call Marijuana a true medical treatment. Data is currently sparse but there is some research that concludes there are significant benefits of Marijuana use. 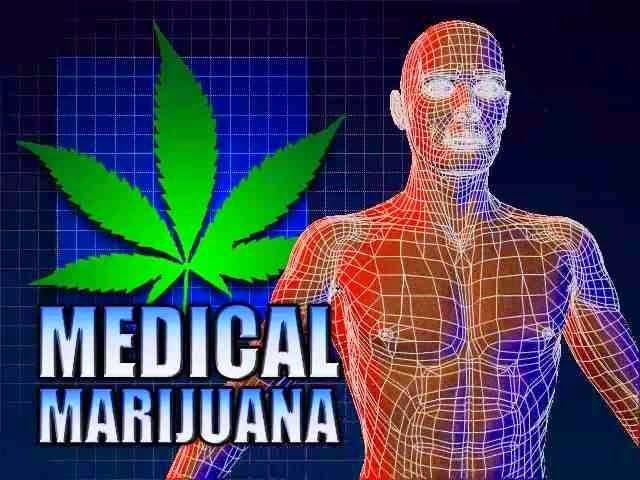 For example, states where Medical Marijuana laws have been passed have lower rates of Opioid overdoses.2 Marijuana has been found to be helpful in the treatment of pain.3 Other studies have shown improvement in some of the complications of Multiple Sclerosis, Glaucoma and several other medical conditions.4 A review of a full list of studies can be found here. Many of these studies are small in size, do not control for the potency or strain of Marijuana, are not placebo controlled and have yet to be replicated. However, the future research must build on these data sets and to expand our understanding of the benefits of Marijuana use. There is also some preliminary evidence that Marijuana is not benign and may in fact have severe negative consequences. A recent article in the New York Times discussed brain scans of infrequent Marijuana smokers which showed structural changes in two significant regions of the brain. In these 20 subjects and 20 subjects in a separate study, the more these young adults smoked the greater their differences. It is important to note these studies have many limitations and can only go as far as to conclude there is an association between Marijuana use and these brain changes. As they are not randomized and placebo controlled they cannot determine if Marijuana is the cause. The article goes on to note that current Marijuana is much more potent (powerful) than in the past. In some cases as much as 4x more potent today than in 1995. 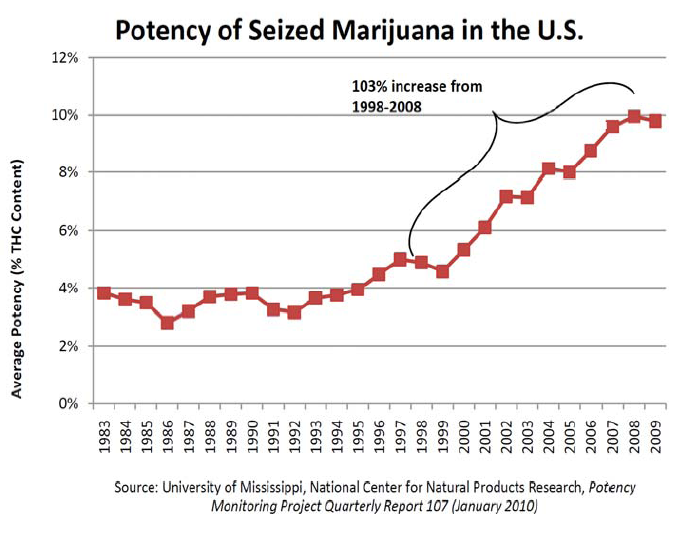 (See Potency of Seized Marijuana, below). More potent Marijuana is more likely to cause significant effects (positive or negative) at lower doses than previously required. This may explain, as the article notes, why Emergency Room visits related to Marijuana nearly doubled from 2004 to 2011.5 Admissions for treatment of Marijuana Addiction have also double since 1995. 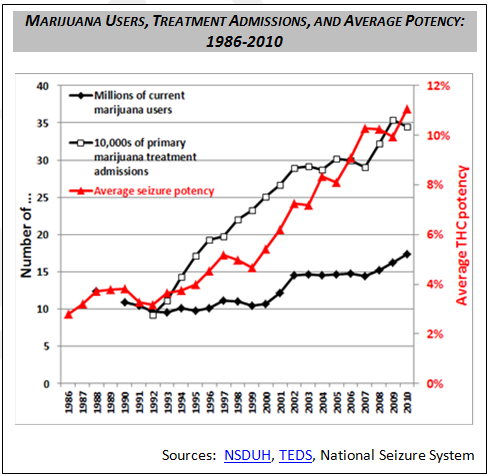 (See Marijuana Users, Treatment Admissions, below). When using any substance recreationally (i.e. not specifically intending to treat a medical or psychological illness, but instead for some-other intended benefit) you are consciously and/or subconsciously weighing the pros and cons of use. For example, if you go out drinking with friends and the pros of drinking (inhibition, social interactions, fun etc.) 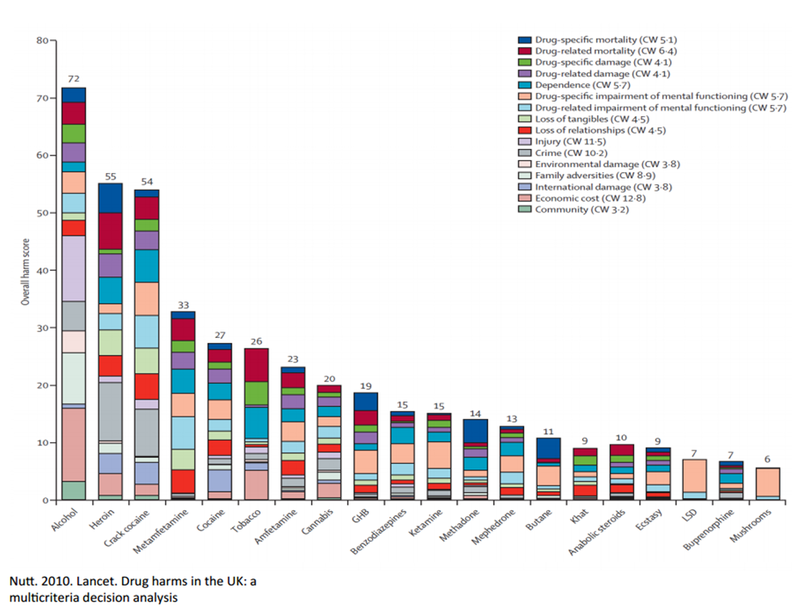 are outweighed by the cons (hangover, DUI's, negative impact on mood etc. ), you are likely to curtail your drinking in the future. However, if you continue to drink heavily, despite the negative consequences, this can be a sign of addiction and a possible Alcohol Use Disorder. Following this analogy to its conclusion, it is important to note how recreational Marijuana use is impacting you both positively and negatively. Marijuana oftentimes does not impact your behavior or cause legal problems as quickly and significantly as alcohol (see image below). However, using this resource from Medline may help to better grasp the less obvious risks (and benefits) which I hope will help you understand if Marijuana is right for you. Additionally, if you are finding far more cons and negative consequences vs positive ones, you could be developing Marijuana Use Disorder. 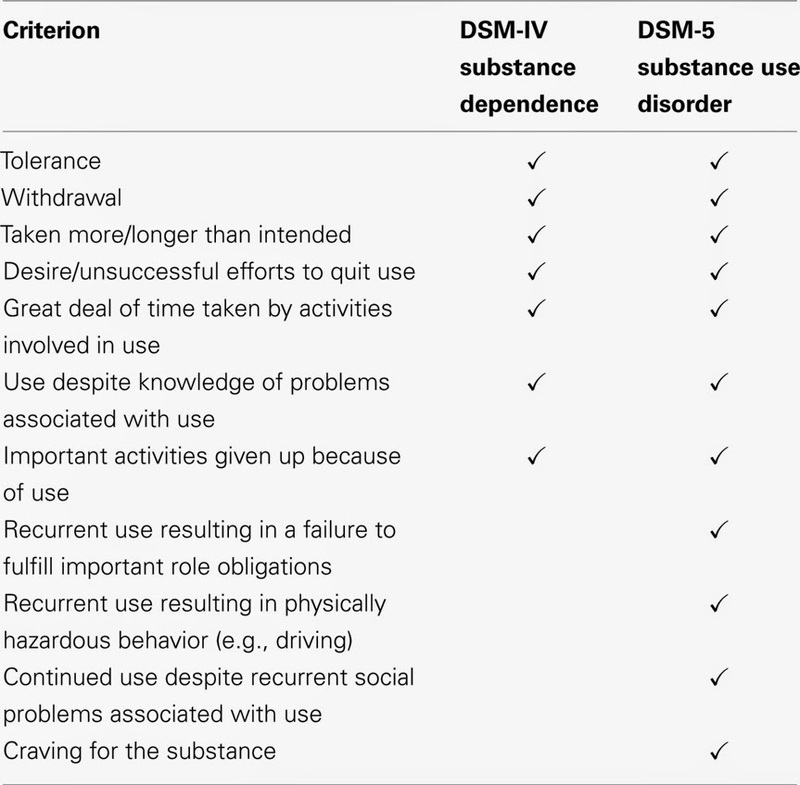 (See below for the full criteria for Marijuana Use Disorder) If you are worried about your Marijuana use, or are having trouble cutting down or quitting, speak with your primary care doctor and seek a consultation with an addiction specialist or a psychiatrist. I hope this information is useful and helps you to better understand the issue of Marijuana legalization for recreational use and also medical use of Marijuana. My goal is to help you and my patients better understand this complex topic and also make a well educated decision regarding Marijuana use. Everyone is unique and like any substance Marijuana impacts everyone differently. As we move forward in the coming months and more States continue to legalize Marijuana, access will continue to increase. It becomes even more vital that we encourage, support and advocate for Marijuana research to help us better understand the benefits and risks of use. We must also support education for youth and treatment programs for those who develop addiction. I look forward to hearing your thoughts and continuing the discussion.